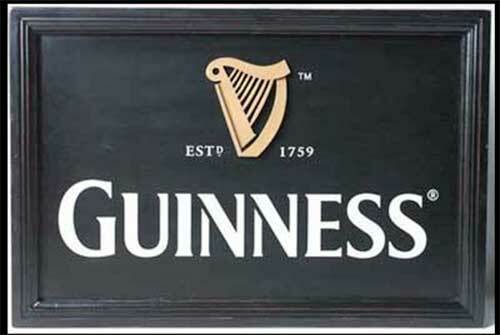 Guinness bar sign is a wooden design that is enhanced with a carved harp. The wooden Guinness bar sign has a distressed appearance. This Guinness pub sign features a dimensional carved harp logo. The hand painted and framed wooden Guinness bar sign measures 19 1/2" wide x 13" tall and it would be at home in any Irish bar or man cave. Wooden Guinness pub sign has the Extra Stout label design. Wooden Guinness pub sign features the saying, There's Nothing Like a Guinness! Guinness neon sign is a pint shaped sign that would be ideal for either the home or bar. Metal Guinness bar sign has a smiling pint and says There's Nothing Like a Guinness.